John Laity set up a charity called Flying for Freedom in 2009 which teaches wounded, injured, and sick service men to fly Microlight aircraft. I left university and went straight into a job at a paper converting machine company in Southway. I saw the job on a board in the mechanical engineering block and was hired as a Design Engineer. Following a year 'on the drawing boards' I was let loose on several designs of paper napkin making machines. After four years’ service I moved into packaging machinery at Kliklok Woodman in Bristol where I designed and patented two designs for handling cake and biscuit products. In 1994 I got a job with the CAD Company Parametric Technology (PTC). It was a lucky break, as not long after I joined, the company took off and experienced growth equal to that of Microsoft. Working at PTC moved me from engineering into consultancy, sales, and marketing, where I have been ever since. My most interesting experience was in 2003 when I was hired as Managing Director for Onecall Entertainment. Onecall managed marketing and PR projects for the IT industry, including product placement in movies such as Alfie, James Bond, and Tomb Raider 2. Engineering never left me though; whilst promoting technology products, I was asked by the special effects team for Batman Begins (2005) to help source Formula 1 speed-rated wheels and a jet engine for the ‘Tumbler’ car. So people can genuinely now say, 'John can put wheels on the bat mobile'. In 2009, I decided to put my marketing and fundraising skills to good use and I founded a charity called Flying for Freedom that teaches wounded, injured, and sick service men to fly Microlight aircraft. We replace lost and broken limbs with wings. Having set up a successful charity project that has the support of the Duke and Duchess of Cambridge and Prince Harry, I find it impossible to get hired for full-time work. 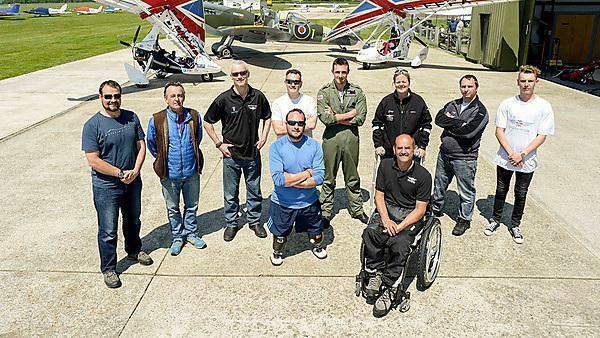 Flying for Freedom is all about challenging people’s perceptions of disability. It is also about challenging the able bodied to 'do something'. I guess this comes across at interview and I seem either over qualified or maybe “a handful” for most people hiring staff. I am OK about it, though; I am sure people turned down Sir Edmond Hillary all the time. Every day at Kemble Airfield a wounded, injured, or sick person experiences freedom from their disability by taking to the sky: it gives them a status and replaces self-esteem lost through injury and trauma – and all because I had an idea that I stuck with and saw through. It is something I am very proud of. There are no tangible rewards for doing something worthy with your life. If you want to build something that benefits others, it will take massive sacrifices and the only real return you can expect is in the gratitude of those you help. However, doing something really worthy with your life will help you realise that 'impossible' is a state of mind, it is not a fact. It taught me the importance of friends. I met my closest friends in Plymouth who I can rely on even now. The atmosphere at Plymouth is very different from other academic institutions I have visited (I spent time working for the Department of Education, so I have seen loads). Studying at Plymouth fosters a community of students, which is very rare (probably due to all the 'liquid sunshine' you get in Plymouth). I recommend education to anyone who has an enquiring mind, but I recommend Plymouth to anyone who wants to have fun living and learning in the same place. For more information about mechanical engineering please visit our BEng (Hons) Mechanical Engineering. For more information about our range of courses within the School of Engineering please visit the school page.